Great review! I understand your reserve at the thought of someone speaking for God today. There is so much garbage “out there”, but I do honestly believe that He speaks through you, me and others all over the world.I love how your wisdom to be cautious did not block you from being blessed by Him. That is a lovely grace isn't it? I am thrilled. You convinced me to read this book. Thanks, for the feedback, friends! I sometimes do e-mail bu thought I would comment here today:@ Elna- you will not regret it as @ Pam can attest to above! 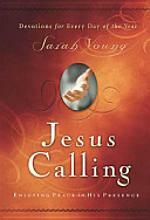 Thanks Susie as always for your input, and am I did read God Calling as well! We continue to have MUCH in glorious common, sister! Have a blessed Sunday! I had the exact same reservations about this book. I'm glad she is clear that her words are not God's words. I have this book, but haven't been very diligent in reading it. Thanks for the review! Now I am curious after reading your post. I too, have had my reservations, but may read it.